Lets face it we all hate the day when we have no clothes left and you spend for ever and a day to wash them. Thanks to Lee Wei Chen we now have a reason to look forward to laundry day, instead of dreading it. 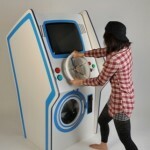 The Kingston University design MA student Lee Wei Chen came up with the perfect solution to liven up the depressing, yet necessary ritual of laundry. 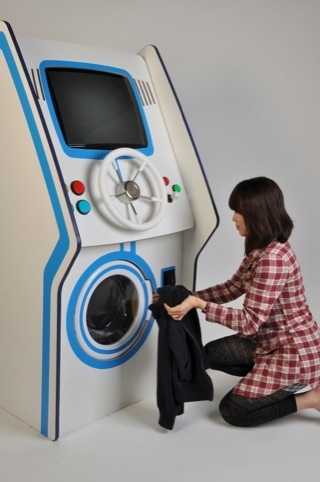 Bringing the childhood charm of video game arcades into the dull, domestic sphere of adulthood, Chen’s amusement washing machine puts an entirely new, well, spin on laundry. 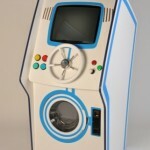 The machine looks like an arcade style video console – although the bottom half of the unit is a washing machine, with the components’ circuitry linked together. 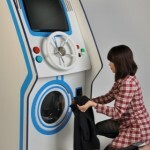 Therefore, the washing cycle is dependent on the success of the person playing the game, meaning that if they struggle, extra coins are needed to make sure the washing cycle is completed. So thanks Lee Wei Chen now us women can sit back and relax while the men do the washing.